Q Mobile is introducing latest feature phone with phenomenal features for its valued feature phone buyers. This time it has launched QMobile ATV 1 feature phone in black color with latest amazing incentives. This is an excellent feature phone with slim body structure along with stylish body color. It is providing high quality memory option in this along with external micro-SD storage supported up to 16GB. Dual SIM option is also available in this cellular phone and buyers can easily avail two SIM cards in this mobile phone. It is reliable and strong body structure feature phone of Q Mobile. It is also providing highly quality camera option in this mobile phone for using and users can avail camera facility of this product for capturing images or recording videos. 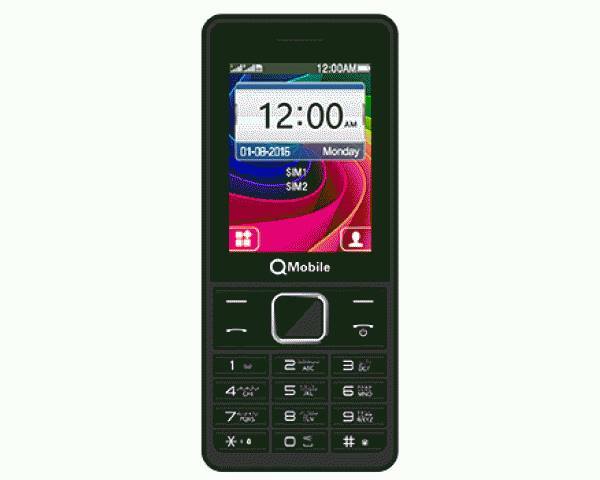 QMobile always brings feature phone in reasonable price and this hand-set has introduced along with very cheap charges. All the different criteria cellular operators are eligible for buying this hand-set for using with correctly. It is also providing some latest feature phone technologies in this mobile phone like users can avail auto-recording calling option and SMS block service. Buyers can easily block any wrong number for receiving SMS in this cellular phone and it is really helpful option is available in this mobile phone. The weight of this feature phone is very light and users can easily take this hand-set on pocket for going anywhere without any issue. This is latest feature phone of Q Mobile and it has included countless unique features in this product for its valued feature phone buyers. Get the complete specification details of this mobile from the below. Memory: External Micro-SD storage supported up to 16GB. Audio: Wireless FM Radio, Audio players and 3.5mm audio jack. Ringtones: Downloadable, Polyphonic ringtones and MP3. Other Features: Dual Standby, Torch, LED Flash Camera, Calendar and Speaker phone. Latest Features: SMS Block Option, Auto-call recording feature, Internet browser and MRE Supported. You may also like it: QMobile Eco 2.